Students will use information they have learned from viewing parts of the PBS "Napoleon" series, study and research about the U.S. Constitution to compare the effects of Napoleon's civil code on France and the U.S. Constitution on America. Students will learn and study how these laws are interpreted over time. They will also compare and contrast the two legal systems these laws created. Understand the institutions and practices of government created during the Revolution and how these elements were revised between 1787 and 1815 to create the foundation of the American political system based on the U.S. Constitution and Bill of Rights. Begin with a brainstorming session where you ask students to list as many of the Amendments as they can from the Bill of Rights. Continue by asking students to think about the first ten amendments and why the founding fathers believed they were necessary in order to make the U.S. a strong country. Be sure to discuss the fact that many people worked together as a group to form the Constitution. Discuss why the Constitution has lasted and been effective for so many years. Now turn students' attention to Napoleon. Have them brainstorm a list of ideas and characteristics that come to their mind when they think of him. Guide students as they brainstorm so that they will hit on the idea that Napoleon was a lawmaker. Show students Episode One "To Destiny". Point out as you go that Napoleon came from humble beginnings and often felt different from those around him. In what ways did Napoleon feel like an outcast among his peers? Why did Napoleon feel his military career would be limited by his Corsican background? How did Napoleon feel the French Revolution would "set him free" and "open up" French society? Why do you think these events made Napoleon feel like he wanted to rule the world? Students should discuss their answers to the above questions in small groups, or the teacher can facilitate a classroom discussion about these topics. The instructor should be sure that students see and understand that Napoleon felt that the previous social structure and class system limited one's potential simply because of backgroundpeople were not allowed to achieve above their level or move from one level to another. Ask for student opinions about how they would feel if this were the case for them. Even more interesting, ask students if they ever feel that in the U.S. we have a form of "class" system that "keeps people in their place." What does Napoleon mean when he says, "I am the Revolution"? Napoleon says, "A newborn government must dazzle and astonish." What do you think he means by this and how will his new government do these things? It is said that the new government was "rule for the people, but not by the people." Why do you believe Napoleon wanted his government this way? How is this different than the way the U.S. government is structured? Napoleon wanted his work to endure forever, so he appointed himself Emperor. Why would becoming an emperor make his work live long after he was gone? Once students have finished viewing and answering questions, the teacher could facilitate some class discussion about the answers to the various questions. Another technique would be to stop the video after the information for each question is presented and allow students to work in small groups to come up with answers. They could then share those in a large group at the conclusion of the video. Once discussion is finished, students should look specifically at the code of conduct that Napoleon authored and that French law is based upon today. 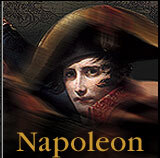 Again, this is available in its entirety or in a shortened version at http://www.napoleonseries.org/. Have students pick out what they believe are the strong or "good" parts of the code. Now have students look for parts of the code that they disagree with or that they believe are weak. Once the strengths and weaknesses of the code are found, they should be recorded on a large list that the whole class can see. The teacher should facilitate debates as they arise, since some ideas could be both strengths and weaknesses. When the chart is complete, turn students' attention to the U.S. Constitution's Bill of Rights, available online at http://www.nara.gov/exhall/charters/constitution/conmain.html. Have students pick out what they feel are the strengths and weaknesses of our governing document. Again, make the list of strengths and weaknesses and post it, with the teacher again facilitating debates as they arise. Students can use what they have learned about both documents to draft a governing document of their own by choosing the strongest parts of Napoleon's civil code and the U.S. Constitution. Once students have decided which parts of each document should be included, they should construct the document and give it an appropriate title. Students should be able to explain why they chose to include what they did and why some elements were left out. This could be done as a large group activity or in small groups with each group presenting to the rest of the class. The document(s) should then be posted in the classroom for others to see or for future use/reference. Students could write a short written response that answers the following questions about the document they created above. Why did you think it was important to include the ideas you chose for your governing document? Give specific examples or reasons. Some ideas from Napoleon's Civil Code and the Bill of Rights were left out. Why did you think it was better not to include these ideas in your document? Give specific reasons or examples to support your decision. Why do you believe the document you created could be a successful means for governing people? Explain your reasons. When looking at strengths of the two documents and the fact that they have both endured for more than 200 years, discuss how a set of laws and ideas this old can still apply effectively to people today. Students could choose a law that they feel should be changed. They could do research and develop specific ideas about how to change that law. They could then draft a letter to an appropriate lawmaker asking them to make the changes to the law they have learned about. This could be done with city, county, state, or federal laws. Addresses for legislators should be available from local election offices or boards. Lisa Prososki taught English, reading, social studies, and technology courses throughout her twelve years as a school teacher with North Kansas City Schools in Kansas City, Missouri. She is currently operating a consulting business from her home while being a full time mother to her 1 year old son.